NBA Portland Trail Blazers 1970 t-shirt. Color: Red. Length down back 26.5. There are also so many variations of each color. It is hard to always describe colors exactly. Used clothing has been laundered. This Ladies Small Purse Bag Wristlet weighs only 5 oz. Adidas Portland Trail Blazers Tank Top. Length from front neckline - 21.5". Armpit to bottom: 16". neck to bottom: 22". 26" Long from collar. No holes or stains. 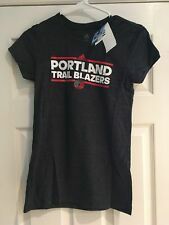 Team: Portland Trail Blazers Brand: Adidas Gender: Women Size: Medium Product: Screened Logo T-shirt with Rhinestone Net Design Material: 50% Polyester 50% Cotton Condition: New without Tags. Team: Portland Trail Blazers Brand: Adidas Gender: Women Size: Large Product: Long Sleeve Screened Layered Look T-shirt Material: 100% Cotton Condition: New without Tags.